Sometimes it seems that everything I want comes from Etsy these days. 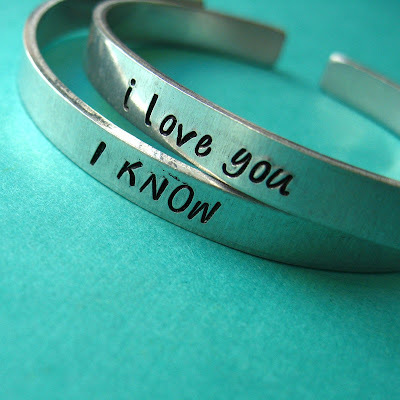 Here's today's addition to the wish list: Han and Leia cuffs. In fact, I like quite a few of the items in the Spiffing Jewelry shop. The shockingly classy Antoine Dodson collar stays, or the Yoda bracelet, for instance. Thanks to the lovely Jenn for her tweet about these awesome cuffs.